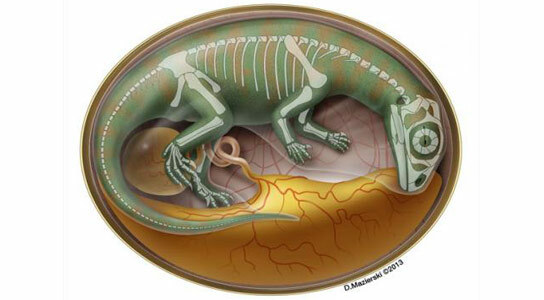 An international team of scientists excavated and analyzed over 200 bones from dinosaurs at different stages of embryonic development from a 190-million-year-old dinosaur bonebed, revealing how dinosaur embryos grew and developed in their eggs. Led by University of Toronto Mississauga paleontologist Robert Reisz, an international team of scientists from Canada, Taiwan, the People’s Republic of China, Australia and Germany excavated and analyzed over 200 bones from individuals at different stages of embryonic development. The bones represent about 20 embryonic individuals of the long-necked sauropodomorph Lufengosaurus, the most common dinosaur in the region during the Early Jurassic period. An adult Lufengosaurus was approximately eight meters long. The disarticulated bones probably came from several nests containing dinosaurs at various embryonic stages, giving Reisz’s team the rare opportunity to study ongoing growth patterns. Dinosaur embryos are more commonly found in single nests or partial nests, which offer only a snapshot of one developmental stage. To investigate the dinosaurs’ development, the team concentrated on the largest embryonic bone, the femur. This bone showed a consistently rapid growth rate, doubling in length from 12 to 24 mm as the dinosaurs grew inside their eggs. Reisz says this very fast growth may indicate that sauropodomorphs like Lufengosaurus had a short incubation period. The Taiwanese members of the team also discovered organic material inside the embryonic bones. Using precisely targeted infrared spectroscopy, they conducted chemical analyses of the dinosaur bone and found evidence of what Reisz says may be collagen fibers. Collagen is a protein characteristically found in bone. Only about one square meter of the bonebed has been excavated to date, but this small area also yielded pieces of eggshell, the oldest known for any terrestrial vertebrate. Reisz says this is the first time that even fragments of such delicate dinosaur eggshells, less than 100 microns thick, have been found in good condition. The research is published in the April 11 issue of Nature. 1 Comment on "World’s Oldest Dinosaur Bonebed Reveals How Dinosaur Embryos Grew and Developed"
If I were a scientist say in this I would be fired 190-million-year-old dinosaur is a lye maybe a thousand years what about soft tissue on the bones?